I was trying to think of fun recipes to try to post on the blog and one day after eating a delicious Western Bagel with cream cheese I exclaimed to a co-worker “Oh! I can make bagels!” She looked at me like “Thanks for sharing,” Hahaha, but I had a moment of inspiration and I couldn’t help but exclaim it to all around. I have never eaten a homemade bagel before this recipe and I think it’s safe to bet that neither have most people. Get ready because you are in for a treat. I’m serious, you will never want to eat store-bought or even deli bagels again. Big claim, right? Trust me. Like all of my recipes it started with a lot of research through cookbooks, blogs, magazine, etc. After I finally came to an understanding of the basics regarding making the dough I had to face my biggest challenge yet, the method. While on my quest to “bageldom” I was forced to throw out so many batches of dough simply because the methods I tried did not work for me. Frustrating! What methods are there you ask? Well, there is a method to blend the dough and a method shape the dough. To blend the dough together you can use a food processor (NO! ), a stand mixer (NO! ), or a non-metal bowl and a non-metal spoon (YES!). Even on the lowest setting with only the slightest amount of time both the food processor and the stand mixer will turn your dough into a large hard rock. UGH! The other challenging moment for me in regard to method was shaping the bagel. To make the bagel’s shape you can either roll the dough into a strip then wrap it around your fingers and roll the ends together to form the circle (NO!) or roll the dough into a ball and poke a hole in the center (YES!). When I tried the “rope” method the bagel looked too lumpy, came out an odd shape, and I found it difficult to seal the shape together. To get that classic bagel shape the “poke” method is best, and easy. After obtaining my bagel education I finally came up with an easy delicious recipe that I hope you try. You will not be sorry you spent the time and you will surely impress anyone you serve it to. Prepare a large non-metal mixing bowl with non-stick cooking spray and set out an additional large non-metal bowl aside without the non-stick cooking spray. Prepare a floured surface for later. Lightly mix flour, salt, 1 Tb. sugar in the a large non-metal mixing bowl. After dough has risen for 1 hour punch the dough down and let it rest an additional 10 minutes. Fill a large pot with water ¾ the way up and add 1 Tb. sugar. Set to boil. Take dough out of the bowl and on a floured surface knead it lightly into a slight rectangle shape. Gently cut the dough into 5 equal portions. Gently roll each portion into a ball and then puncture a hole with your finger in the center of the ball. Stretch the hole slightly then place bagel back on the floured surface while making the remaining bagels. Once all bagels have been shaped and water is boiling place no more than 2 bagels in the water at a time with a slotted spoon. Bagels may sink to the bottom of the pot briefly but will quickly rise to the top. Allow the bagels to boil on each side for 30 seconds each. 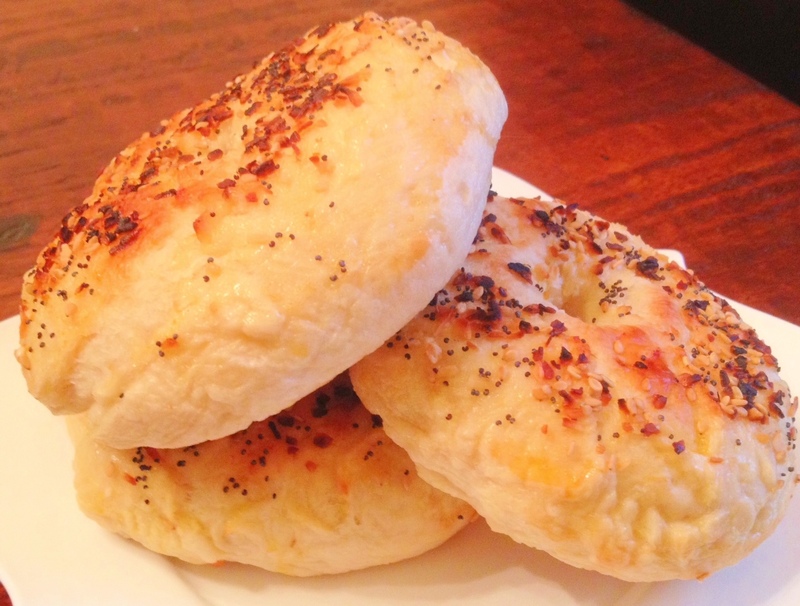 Place boiled bagels on the prepared baking sheet. Whisk egg in a small bowl then brush the tops of each bagel with the egg wash.
Sprinkle the tops of the bagels with coarse salt, garlic powder, minced onion flakes, poppy seeds, and sesame seeds. Bake bagels for 20 minutes, flipping at the 10 minute point.